Fanuropita or fanurija is a cake which is mostly prepared in Bitola and Prilep on 9th of September when the day of St.Fanurij the martyr is celebrated. This cake is also widely prepared in Greece on every 27th of August. It's a lovely, traditional low-fat cake. It's named after the holy Fanurij or Fanuriosu, a young man who once lived on the island of Rhodes. This cake is also prepared when you want to find something (or have lost a job, love, home ...) or to fulfill a wish. People pray to the holy Fanurij, make this cake and holy Fanurij will bring you what you want, or what you've lost. Short story about Fanurij: His mother was a bad woman, and when she died, nobody prayed for the repose of her soul. Fanurios, honest and a good fellow, helped everyone and he didn't charged people for his help, but begged them to pray to the Lord to forgive the sins of his mother. The young Fanurios died very young. In his memory, and in memory of his mother, a woman from the island of Rhodes began to make this cake. St. Fanurij a glorious martyr which is celebrated on September 9 and believed that he helps in fulfilling the wishes of the people. 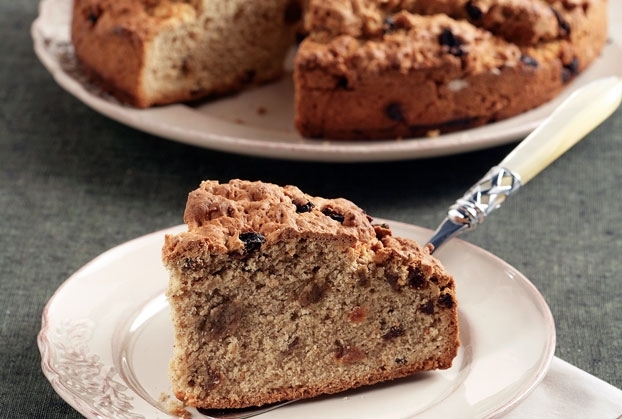 On that occasion, believers knead this cake with 9 ingredients. Custom is to bring this bread with a candle in the middle, along with a little red wine in church to be blessed and sung by a priest. Once the bread is blessed, it is broke with hands and given away with a good thought to other believers in church, at home, friends etc. It is interesting that while bread is kneaded, the person who kneads it prays for grace, happiness and peace in the family, and then makes a wish. In the Greek language the verb "fanerono" means "to show", so this cake is prepared when you lose or loss something. Fanuropita is always made of seven or nine ingredients. Take a bowl and mix the orange juice, olive oil, sugar, cinnamon, baking soda, baking powder and flour with fanta until the mixture is smooth. Add raisins and grated orange peel in the end. Grease round pan with a brush and sprinkle sesame seeds on the surface. Pour the mixture, sprinkle with sesame seeds and garnish with almonds if desired. Bake at 180 C degrees for about 50 minutes. When ready and when cooled, cut in 9 pieces and sprinkle with powdered sugar. Share with 9 families. The tradition of this cake-pie is to take it to church to be consecrated.